TORONTO - Supporters of Mr. Laibar Singh, a paralyzed Punjabi man will be gathering at the Greater Toronto Enforcement Centre (GTEC) to voice their objection to the continuing attempts to deport Mr. Singh. 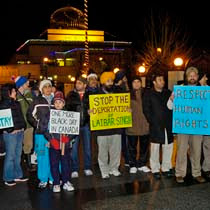 The latest attempt to deport Mr. Singh took place the morning of Wednesday, January 9, at 4:30am, when enforcement officers from the Canada Border Services Agency (CBSA) made an unprecedented effort to breach the sanctuary of the Surrey Guru Nanak Gurudwara (Sikh Spiritual Centre) to arrest Mr. Singh. Alarmed by the actions of CBSA, approximately 300 supporters gathered at the Gurdwara to bear witness to this gross violation of their sacred place of worship. The deportation was unsuccessful and a stay was once again granted. Communities across the Greater Toronto Area will be gathering at GTEC to demonstrate their solidarity with the BC community and their struggle to keep Laibar Singh in Canada. They will also express their indignation to the Government's violation of Sikh sanctuary. The photograph is from the successful support of Laibar Singh Ji on 9 January 2008 when CBSA was prepared to violate Gurdwara Guru Nanak in Surrey, British Columbia to kidnap and deport him.